Up until now, the Micro Four Thirds system has been an exciting – but expensive – development in digital camera history. With its interchangeable lenses, it has taken on DSLRs at their own creative game – but in a substantially smaller package. Panasonic's Lumix G Series has been right at the forefront of this brave new innovative world. But although many were tempted by the idea of the cameras like the Panasonic G1 – or Olympus' much-advertised PEN series – when it came to coughing up the dough, the more affordable DSLR designs got most people's cash. 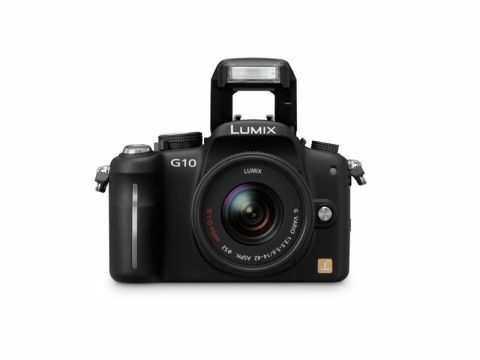 Now that has all changed, with the launch of the Panasonic G2 and its baby brother, the Panasonic G10. Both cameras offer built-in electronic viewfinders, and a conventional SLR-style design – unlike the rangefinder styling of the Olympus PEN or Panasonic GF1. But what creates their appeal is that these competent stills cameras can also shoot high-definition video – which makes their price tags more appealing than seemingly similar digital SLRs. But whilst the G2 sells on the street for a seductive £594 with its kit lens, the G10 goes one giant step better with an actual price of £454 with the same 18-42mm f/3.5-5.6 Mega OIS (optical image stabilization) zoom. You'd be right to ask what gets sacrificed in order to turn an already aggressively-priced model into what seems like the sale of the century. The answer is remarkably little. Both have the same 12.1 megapixel sensor, electronic eye-level viewfinder, and a 3-inch LCD screen. They have a near identical range of exposure, focusing and drive options. • A fold-out, rotating screen. The LCD on the G10 is fixed. • Weight. The G10 is about 35g lighter than the G2, with an all-up shooting weight of 558g. • A choice of colours. The G10 is available in any colour, as long it as it is black. • Eye detection system. To switch between screens on the G10 you have to press a button, the G2 senses when you want to use the eyelevel finder and switches automatically. • AVCHD video format. The G10 can record high-def videos, but only using the Quicktime MPEG format. • Mic socket. On the G10 you can only record sound with the built-in microphone.